It’s summertime, and for many of us, summer means time at a beach somewhere. What a great place to pray! What a perfect place in which to blend our prayer with play. Might we allow ourselves to get lost in the activity of building things with sand? Might we create homey spaces with umbrellas, chairs, mats, and towels? Might we gaze into clouds or across the water and allow that gaze to be a prayer of thanksgiving? Or a prayer of surrender, letting go, asking for help, offering our wounds? We can do the same kind of spiritual meditation in the woods or the mountains, or out in the middle of full summer fields. We can gaze and surrender when we’re in a city park, even if part of that gaze is the watching over of children or grandchildren. We can get lost in the intricacies of their journeys around a jungle gym or in their wide swaying arcs on the swings above our heads. Allow the space you’re in to become a prayerful environment. And although outdoor spaces can be especially good for this, a closed office with a beam of light coming across the floor can serve a prayerful purpose too. Or use a tiny balcony in the nighttime or a humming, busy subway tunnel of the morning commute. 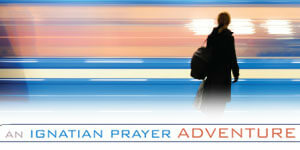 Join in 31 Days with St. Ignatius with today’s entry, Take, Lord, Receive, My Work and Career. Follow along everyday this month here and on social media #31DayswithIgnatius. Vinita. I LOVE your summer series! Prayer comes so much more easily for me when I’m outdoors. I’m very lucky to live 2 blocks from Long Island Sound (in NY), to have a lovely backyard with a pool and perennial and vegetable gardens, and an old-fashioned front porch, complete with porch swing, all settings that make it so easy for me to pray. In fact, I was floating in my pool this afternoon gazing at the blue sky and saying prayers of thanksgiving and praise. What perfect places for me to pray, giving thanks for the wonders of nature all around me! I was visiting friends last weekend. We had lunch at the beach. It was a magic day as we have sometimes here on the East coast of Australia in winter. We went for a walk over the rocks by the beach when Lo and behold a whale breached not far from us. A breathtaking moment . I shot a quick thankyou prayer skyward in gratitude for a magic moment .